Better Bodies Fitness hot pant is a low cut hot pant for dedicated athletes! - You have to be in shape to wear this! It is specially developed for gym & fitness. The fabric in this product has a combo of good elasticity and a tight firm fit that contributes to a perfect fit on a well shaped body! 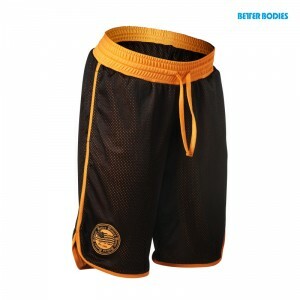 Very soft and comfortable waistband with a great Better Bodies design! High waist, can be folded over for a low waist look. The solid colors are four way stretch fabric. Metallic coated fabric is one way stretch. Small slit on the sides for extra movability.